Healthy, vibrant and glowing skin is the main pre-requisite for a charming face. One of the most popular and effective procedures is the chemical peel, which gives your skin the opportunity for a fresh start. A skin peel enhances and smoothens the texture of the skin. It is an effective treatment for facial blemishes, wrinkles, and uneven skin pigmentation. Skin Peels exfoliate the outer layers of dead skin, revealing a new skin layer with improved tone, texture, and colour. Today, Skin peels are popular because they offer nearly immediate results and can be performed as an outpatient procedure. Glycolic acid, an alpha hydroxy acid (AHA) that occurs naturally in sugar cane, is the most common ingredient of light skin peels. The ingredients and formulation of a light skin peel, however, depend upon the specific patient’s skin care needs. With light chemical peels, the solution is left on the skin for a relatively short amount of time. When applied to the face or another part of the body, the AHA skin peel solution works by removing the outer layers of skin so that a new, smooth layer of skin is revealed. The action of the solution stimulates theproduction of elastin and collagen, essential components of healthy, youthful skin. Glycolic acid peels ( AHA chemical peels) are a safe and effective way to improve the look of sun-damagedskin, and they are helpful in reducing mild acne scars and fine lines. Because these light peelsexfoliate the surface of the skin and unclogpores, they are alsoconsidered and effective for acne treatment. When a Dermatologist refers to “ salicylic peels,” he or she is referring to a beta hydroxy acid peel. Cosmelan is a 2 step intensive topical treatment system designed to reduce and regulate stubborn and dense pigmentation and blotchiness. Cosmelan's blend of synergistic ingredients work fairly quickly, resulting in an effective blending and reduction of undesirable pigment. Cosmelan regulates the melanin activity, causing the pigment producing cells to slow down their abnormal over-production and function in a more uniform way. Cosmelan is "sun-friendly" so you can use the products and still have an active outdoor lifestyle. It works well on all skin types - even darker toned Asian, Mediterranean and Latin skin. Cosmelan will also produce a slight initial peel which helps refinish the skin surface while diminishing hyper-pigmentation. · Effective in all kinds of melasma and chloasma. · It can be used any time of the year. · Compatible with all types of skin. · It permits sun exposure without the risk of spots appearing. · It is completely safe and does not include TCA or hydroquinone. · There are minimal side effects (very little redness and flaking). · Beneficial for acne patients by regularizing sebaceous secretion. · Skin becomes bright and rejuvenated with lightening of spots and brown areas in just 10 days. Trichloroacetic acid (TCA) can be used in many concentrations, but it is most commonly used for medium-depth peeling. Fine surface wrinkles, superficial blemishes and pigment problems are commonly improved with TCA peels. TCA peels are applied to the skin after a thorough cleansing with acetone or other degreasing agent. This is done to assure an even peel. We will taper the strength by applying a slightly lower strength to the ears and neck in order to avoid a major difference in skin tone between the areas. Retinoic acid peel (yellow peel) belongs to skin treatments with a short recovery period. Retinoids (synthesized equivalents of vitamin A) regulate the processes of differentiation, proliferation, and intercellular communication. When retinoids get into a cell, they make a bond with nuclear sensors. As a result, particular sections of the cell genome are activated or decelerated. The main advantages of this treatment are minimal skin damage, a brief recovery period and a low probability of complications. Retinoic acid peel can also effectively cleanse the skin, has anti-inflammatory effects, makes skin glow, improves skin texture and structure, and provides a lifting effect. After a thorough cleaning, the appropriate Peel is gently applied to your face. As the solution works on the skin, the patient will typically feel a warm tingling or stinging sensation. After the solution has been on the skin for the prescribed amount of time, the physician will wash it away with water and apply a soothing lotion. The entire process of a light skin peel treatment usually takes less than an hour, and the patient typically experiences little or no skin redness or other side effects. After a light chemical peel, the patient can expect to return to daily activities immediately. Multiple treatments are usually necessary to achieve optimal results. By reaching only the outermost layers of the skin, a skin peel is pain free and requires no downtime. Skin Peels exfoliate the outer layers of dead skin, revealing a new skin layer with improved tone, texture, and colour. The solutions used for skin peels is usually comprised of alphahydroxy acids (AHAs), such as glycolic, lactic, salicylic, or fruit acids. We believe that each patient is unique, requiring his or her own treatment that is different from anyone else’s. When you come in with something you’d like to change about your appearance, our first step is determining a proper treatment plan for you. This is done with a thorough consultation, complete with listening to your goals and understanding who you are. No wonder, patients from all over the world throng Allure MedSpa to achieve their cosmetic and skincare goals. 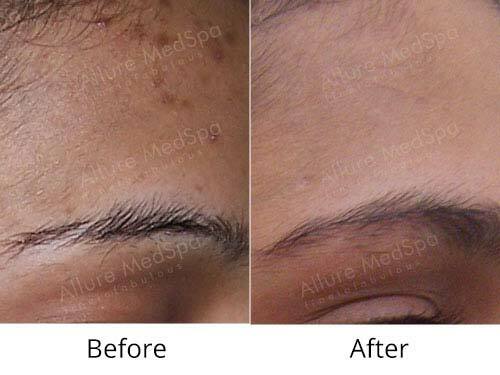 At Allure MedSpa, each procedure is delivered with your individual needs in mind, allowing us to customise your chemical peel for best results.Just as the formulation of the light chemical peel solution is customized for each patient, the number and spacing of the treatments varies according to individualized treatment plan for each patient. After your peel, your dermatologist at Allure MedSpa will give you guidelines to follow to help ensure the success of your treatment. Generally, patients are instructed to use a gentle cleanser and specified moisturizing lotion, and to avoid exposing the treated skin to the sun. 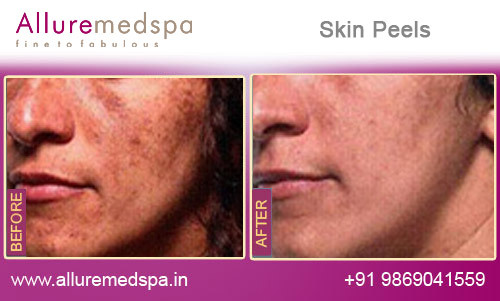 Following your Skin peel treatment, you will notice that the treated skin has improved tone, texture, and pigmentation. You should see further improvement as your course of treatments progresses. The entire process of a light skin peel treatment usually takes less than an hour. Patients might undergo five to eight light chemical peels to achieve optimal results. Just as the formulation of the Skin peel solution is customized for each patient, the number and spacing of the treatments varies according to individualized treatment plan for each patient. It varies with the depth of the peel. Generally, deeper peels have longer lasting effects but require more recovery time. However, it is important to use a high quality broad-spectrum sunscreen to both protect your skin and maximize your peel's long-term results. Ideal candidates for the skin peel procedure are individuals who are unhappy with the appearance of their skin, have realistic expectations of their procedure, and do not smoke. An ideal candidate for a chemical peel is in good physical health, understands the procedure, and has realistic expectations of the outcome. You are likely to be pleased with the results of a chemical peel if your goal is to alleviate acne, smooth wrinkles, improve skin texture, eliminate age spots, or reduce the effects of sun damage. There is no special preparation required. You should prevent the skin from any sun burn before the treatment. 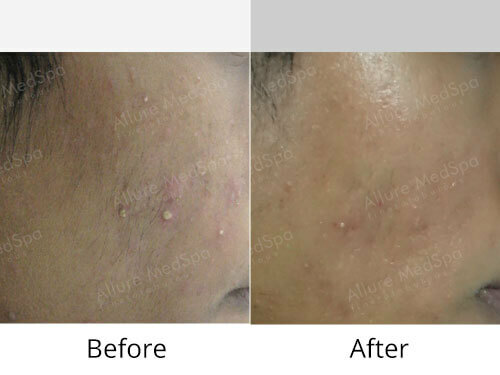 Allure MedSpa’s clientele comprises of local, out-of-town patients. A good percentage of patients also ‘fly-in’ from out of the country to have skin treatments with our renowned cosmetologists. Is a chemical peel painful?No. There is a mild degree of “tingling” or a slightly itchy sensation while the glycolic acid is in contact with the skin. Upon neutralizing the peel, the skin feels fresh and smooth without discomfort. What should I use at home to maintain the condition of my skin after a chemical peel? What does skin peels cost? The cost of Skin Peels Treatment depends on how long it takes to carry out the procedure. 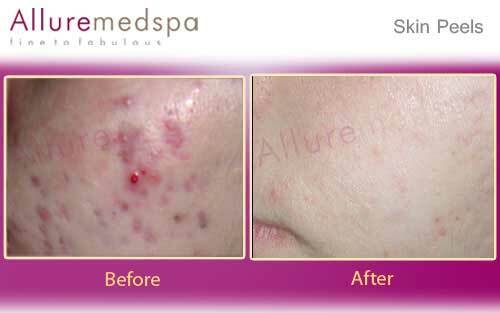 For an estimate on how much a Skin Peels Treatment may cost or to arrange consultation call Allure Medical Spa on +91 22 26732961/62/63. 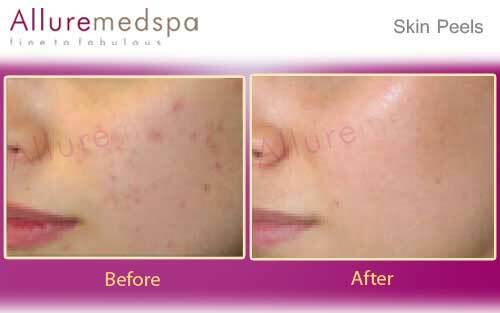 Call Allure medspa today on +91 22 26732961/62/63 for further details on Skin Peels Treatment or ask us to call you back.